Unwrites characters who are well acted but provide very little substance. Anticipate is likely too strong of a word as it can mean “look forward to.” We don’t so much look forward to the expected outcomes as sit quietly and very patiently in our theatre seats awaiting some kind of plot development. The opening third of the film is spent on the relationship between Rory and Dora (Zoe Saldana). Although I personally feel that romance is an unnecessary addition to this type of story, it was perhaps the best part. Cooper and Saldana played well off of each other, and in the end it turns out that they might be the only people to care about. While following their marriage, we are also introduced to Rory’s stagnant writing career. He has potential – he just can’t write anything that sells. His father (J.K. Simmons) is torn between offering him money to try and achieve his dream or forcing him to get a job. In Simmons’ only scene, he pointlessly does both. After a honeymoon in Paris where they visit Hemmingway’s home, and an antiques store and purchase an old, leather attaché case, Rory returns home still unable to write the great American novel. It turns out that he is able to copy another man’s work. Finding a long-forgotten manuscript, Rory copies it word-for-word. Before he knows it, he’s passing it off as his own and becoming an overnight literary success. The final third of the film is about the story that Rory stole and who else might know about the secret to his undeserved accolades. This is where the fantastic acting comes in. 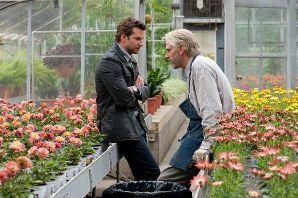 Jeremy Irons plays “the Old Man”, and the underrated Ben Barnes and the under-underrated Nora Arnezeder play the young couple that “The Window Tears” is based on. This is the first I’ve seen or heard of Arnezeder, but if Hollywood is smart, she’ll start gracing more screens. The internal conflicts of having to live with one’s own lie aren’t enough to carry this film because there isn’t anything else to it. While the recounted narrative is well acted, I certainly don’t see how it would be interesting to the masses to warrant such a successful novel. Finally, the worst part was the twist that was suggested at the beginning and confirmed at the end. Because they told us the twist at the beginning, it’s not a twist. Secondly, it undoes any connection we may have formed to the characters. And that was all that “The Words” could have hoped to have going for it.